The following interview of author Dane Zeller is conducted by Mr. O.M. Typing, editor of One Monkey Typing publications. OM: Good afternoon, Mr. Zeller. DZ: Good to be here, Mr. Typing. OM: It is indeed an honor to interview such a distinguished writer who claims to have written his novel on a manual typewriter. OM: Correct. Surely no one will believe that you typed 80,000 words, one manual keystroke at a time, especially in this modern age. DZ: That’s 60,000 words, sir. 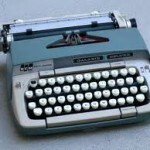 And I guarantee to you and your readers that “Smart Shield” is an honest-to-goodness home-made story typed on my Smith-Corona typerwriter. OM: But there is a quicker way to write a novel, one that would catch spelling and grammatical mistakes. You are truly behind the times if you used a typewriter, Mr. Zeller. OM: Can you prove you typed every word? DZ: Certainly. I have brought with me my receipt for the 1963, Model 17, Smith-Corona portable typewriter that I bought from Dusty Dragon Antiques in Mission, Kansas. DZ: Of course not. I bought a ribbon on line at Ebay for $1.99 plus shipping. DZ: I also bought a half-pint of whiteout from an art supply store. OM: Could you show me the original manuscript? DZ: I could, but my girlfriend used it as scrap paper to print out her novel. OM: I don’t get it. She used it up? DZ: She shredded it when she didn’t need it any longer. 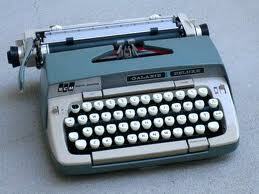 DZ: I might add that my Smith-Corona typewriter was used by Robert Parker to type his novels, too. OM: Okay, I get it. You’re a fiction writer. DZ: Seriously, I can prove it. OM: Ladies and gentlemen, that concludes our interview for today. DZ: Just look at the period key and the comma key. the period is almost completely obliterated. The comma is still clear. DZ: He wrote short sentences, not ones complicated by clauses. OM: I’m turning the mike off, Zeller. DZ: And the quotation mark is nearly gone, too. OM: Thanks for joining us. Thank you, thank you, thank you, Mr. Baker. My faith in readers is restored. Wait ’till you see the fishing lures I bought from a guy named Hemmingway!